My children love books but their bookshelves are an eyesore. Is your child’s library a tad unruly too? You need a monkey to reign them in and Skip Hop has one (or two!) for you. That’s right, Skip Hop, who continue to delight us with brilliant products, have extended their collection with Zoo Bookends. Unlike a traditional bookend these little guys are as cute as they are practical. They look like any other toy found in a child’s room, but are weighted for sturdiness and to control unruly mobs of tales, fairy or otherwise. 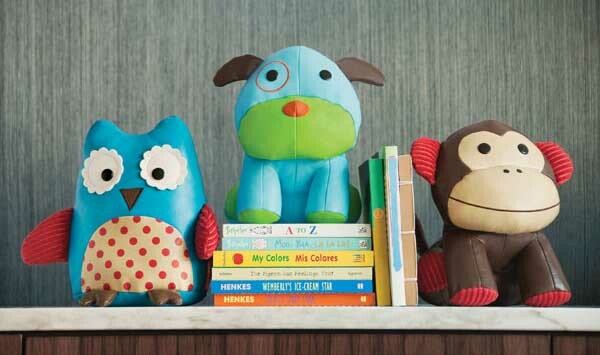 Skip Hop Zoo bookends are sold as a pair and you can choose from monkeys, puppies or – my favourite- owls. All styles are made from faux leather which is great for the sticky-finger-factor and being able to wipe it over for a quick clean. A great gift for any child passionate about books or even a new baby in readiness for a growing book collection! Skip Hop Zoo bookends are priced at $59.95 from Little Styles with delivery extra.